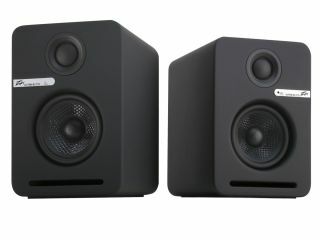 NAMM 2015: The WFS 3.70 speakers are a set of active wireless monitors compatible with both WIFI and Apple Airplay technology, meaning they can stream music from any networked device, including PCs and iOS gear. Multiple speaker sets will also enable Sonos-like audio zones in the home, with separate streams from a variety of sources. January 21, 2015, Meridian, MS — Audio innovator Peavey Electronics® is pleased to introduce WFS 3.70 wireless speakers. The Peavey WFS 3.70 wireless speakers are a set of active speakers with AirPlay® and DLNA® technology, enabling wirelessly streamed music from not only an iOS device but from any media distributed over a network, Mac or PC. Perfect for creating great sounding audio zones all over a home, the WFS 3.70 features a pair of speakers (one active and one passive) with 70 total Watts. Each rubber coated compact cabinet features a 3" Kevlar® reinforced cone driver with dual magnets and a 3/4" silk dome tweeter, resulting in pristine, focused sound. Setting up the WFS 3.70 wireless speakers is easy and takes just a few moments. With multiple pairs, users can have audio zones in their home that can play separately from different sources, or users can have distributed audio from one audio source. For example, music from an iPhone can play in the kitchen, audio from the PC in the living room, a networked media player in the bedroom — or all the audio sources for each zone can be changed. Peavey audio products have been installed in venues ranging from the world's largest theme parks to stadiums to world-class casinos and resorts. Now Peavey's full, robust commercial sound can be enjoyed at home with the WFS 3.70. Dimensions (HxWxD): 6.3" x 4.33" x 5.5"